As you probably know, I am currently enjoying sharing all that is inspirational from Graham and Brown, as one of their brand ambassadors. I’m thrilled that this week sees the inaugural National Wallpaper Week, where we get to indulge in everything that is wonderful about wallpaper. I thought this would be a great opportunity to share some of my thoughts around wallpaper and the impact it can have on your decoration and ultimately your home, as well as some my favourite inspirational designs. I’ve been writing about wallpaper for over 3 years now. Every (well almost every) Wednesday I sit down to construct a post focused on some of my favourite finds and new trends. They might not be for everyone but I hope that you find something inspiring along the way. I have tried to convey that adding wallpaper to your home can add a dimension that paint colour can’t. It can breathe new life into a room, bringing a texture and diversity to the walls that can sometimes be missing. Many of us can be a little afraid to give it a go, and I’m no exception. The last decade has seen a huge resurgence in the use of wallpaper, and there is a huge amount to choose from. Sometimes choice can be overwhelming. Which is why I would always advocate the use of sample pieces. Pin them on the walls and live with them for a while. Make a moodboard and collate samples of your paints and fabrics too, visualising your end result. If you don’t like it, start again. I’m currently looking at how my new home office is going to come together. Currently I’m working from the sofa, so I’m desperate for an inspiring space where I can create and concentrate. 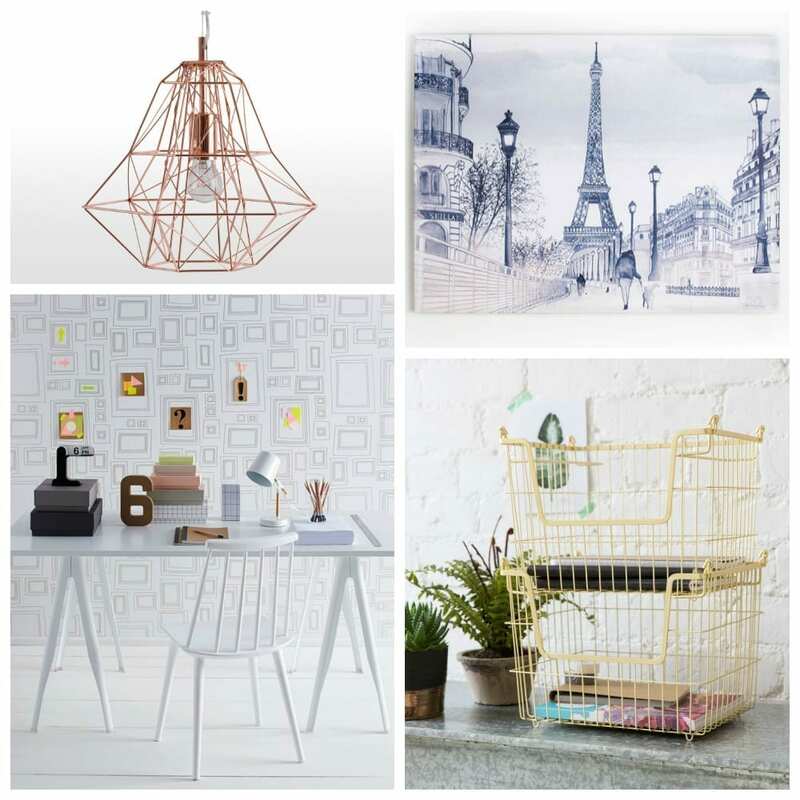 I’m envisioning somewhere light and bright, with splashes of gold and black, filled with artwork and clever storage. So, I do hope you are thinking how you can create an aspirational and inspirational space in your home? Embracing wallpaper is much easier than you think, products like Superfresco Easy even make it easier by allowing you to simply pasting the wall – no need for a pasting table. It couldn’t be simpler. Which wall will you be wallpapering next? I love your Wallpaper Wednesdays (even if I don’t have any papered walls myself – but now I do have papered bookcase doors!) I like your tip of putting up samples and living with them for a while – that might encourage me to be more brave. Good luck with your home office planning, I’m sure it will be wonderful, from the inspiring mood board. I’d love to wallpaper our dining room, which we’ll be redecorating once our kitchen’s finished. Something bright and interesting – to stimulate thought and conversation! I love that Mirage wallpaper it is fabulous! Wallpaper can make a dramatic impact, or a soft style statement. It also covers up walls that need a little TLC. We have a lot of wallpaper in our house! Wallpaper Wednesday is such a great idea! <3 I really, really want to buy wallpaper of Istanbul. Not so sure where I will put it but I saw very nice wallpaper of Ist in Ist 😀 So, maybe next time when we are there I will invest in wallpaper. As an independent wallpaper retailer (opened June 2015) I find the notion of National Wallpaper Week quite disheartening. Maybe I’d feel differently if I stocked G&B wallpapers and reaped some of the benefits, but since they sell direct to the public online I saw no business opportunity for us, so we don’t stock them.